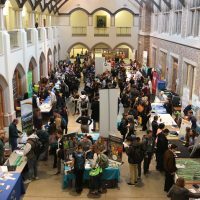 Open to all UW students and alumni, the Environmental Career Fair is an opportunity to explore careers in environmental and natural resources fields. 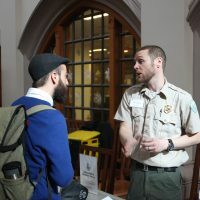 The Environmental Career Fair features employers from the nonprofit, government and private sectors with career-level positions and paid internships. Contact envjobs@uw.edu with questions about the Environmental Career Fair. The 2020 Environmental Carer Fair will be held in February 2020. The exact date will be announced during Autumn 2019. 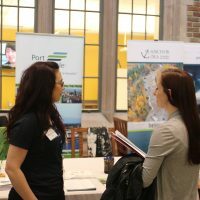 The 2019 Environmental Career Fair was held on February 20, 2019, 11 a.m.-2 p.m. at Mary Gates Hall Commons. See below for a list of employers featured. Do your research — review the employer’s website before the career fair so your questions are specific. Dress professionally — first impressions are important. Introduce yourself — work on your brief elevator pitch and tell them what skills, education and experience you have. Be specific about how these skills relate to the organization or position that you are pursuing. Don’t talk to the employer you’re most interested in first. Leave them with something — provide them with your resume and contact information. Follow up — ask for a business card or contact information and follow-up with employers after the fair to thank them for their time and remind them of your interest. For even more tips for career fair success and other job search tips, visit the UW Career and Internship Center. Get more insight for early career success from representatives who attended the UW Environmental Career Fair in previous years. Contact envjobs@uw.edu for employer registration information.